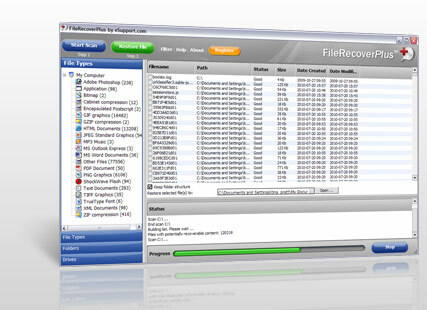 FileRestorePlus is a quick and effective way to retrieve accidentally deleted files, files removed from the Recycle Bin, in a DOS window, from a network drive, from Windows Explorer with the SHIFT key held down.Undelete Plus supports all Windows file systems for hard and floppy drives including FAT12/16/32,NTFS/NTFS5 and image recovery from CompactFlash, SmartMedia, MultiMedia and Secure Digital cards. Scan your system for FREE! ...... Scan your system for FREE! * Quick and easy recovery of deleted files. * Great tech support- our staff is always there to help. * Advanced technology ensures the best possible file recovery. * Fast scan engine allows to scan a hard drive within minutes. * Supports FAT16, FAT32 and NTFS file systems. * Supports all modern types of hard drives. Qweas is providing links to FileRestorePlus 3.0.2.1214 as a courtesy, and makes no representations regarding FileRestorePlus or any other applications or any information related thereto. Any questions, complaints or claims regarding this application FileRestorePlus 3.0.2.1214 must be directed to the appropriate software vendor. You may click the publisher link of FileRestorePlus on the top of this page to get more details about the vendor.